Tools for checking HTTP requests and responses from a server are required for your web server™s response to a particular request. Here is an updated article. This is an updated article which was published 4 years ago on this website, it got deleted due to corrupted database as we needed to move and change the whole setup for SSL. Practically these kind of articles are evergreen and time standing. As there are lot of new things has arrived in this 4 years, it became more relevant to the readers. Most importantly, we need to know about the HTTP Error Codes. Common response codes are known, but less known error codes force us to check some reference. 500 Internal Server Error is quite common for WordPress; obviously a WordPress user will know the name. But, Error 503 thrown by HTTP accelerator Varnish is less known – it is called Guru Meditation Error. Today, there are many tools; including the free tools which can be installed on our own server, like Rackspace Cloud Monitoring Tool. As we have said, this is an article which was published before, we only mentioned few tools on that post. We are citing them as for historical and real working purposes. We mentioned Firebug, Firebug must be listed among the free tools for checking HTTP requests and responses from a server. From the network monitor in Firebug you can see all the requests made by loading the current page, the total time and total size of all elements on your back and the headers sent and received, status codes and time response to each request. YSlow and FireCookie were available as Addons in Firefox. If you are using Firebug and other FF Addons as tools for checking HTTP requests, it is recommended to use FireCookie and YSlow as additional tools. Web-Sniffer: Very old and well known among the free tools for checking HTTP requests and responses from a server. Rex Swain™s HTTP Viewer : Another mentionable tool among the tools for checking HTTP requests. Check HTTP Header : Like other tools for checking HTTP requests, it serves the same purpose plus shows the meta descriptions. With this list of tools for checking HTTP requests, you should be able to check the HTTP headers and status codes that your web server responds to a particular request. This ends the old article. wget --save-headers -qO - "$@"
This Article Has Been Shared 3703 Times! 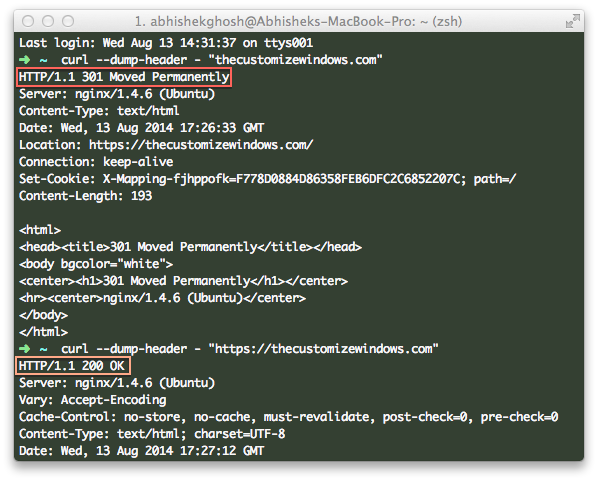 Cite this article as: Abhishek Ghosh, "Tools For Checking HTTP Requests and Responses From a Server," in The Customize Windows, August 13, 2014, April 25, 2019, https://thecustomizewindows.com/2014/08/tools-checking-http-requests-responses-server/.